"Quick, pull with all your might! I can feel something tugging on the feline!" "Somebody do something, for kitty's sake!" That's the worst case of gingervitis I've ever seen in a shark! Jaws is spitting out a hairball. "What...?" asked Bruce, innocently. "I'm just tickling his tummy." There will be whaling and gnashing of teeth. Sing to a different Tuna. "I think I've got a bite." Look what the cat's caught in. "Apologies to all my past girlfriends. I never knew it was so painful." "Oh God, Martha, I beg of you! No more of that "Baby Shark" song!" "That huge cat from next door has been picking on tiddles again"
"What, that great white one?" "No-o-o-o! I'm supposed to be the one eating the fish!" 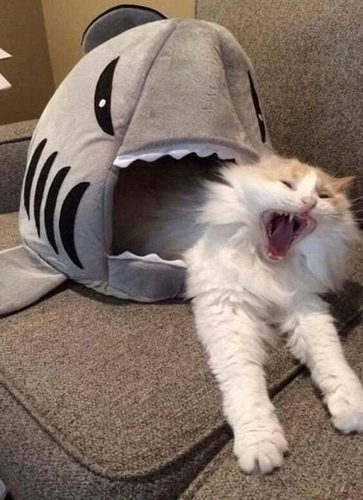 Fun fact, sharks contain no bones, only catilage.